SAS offers free software to students for learning purposes. There are a number of options for students to access SAS software depending on their requirements. SAS University Edition can be downloaded and installed locally on a Virtual Machine. This is the latest version of SAS 9.4. SAS On-demand for Academics is a cloud application, all students need to do is to sign-up and they will have access to a SAS Studio Environment that can be accessed remotely from any browser. SAS Viya is a newly developed cloud technology and supports many of their latest applications, such as; SAS Visual Analytics, SAS Visual Statistics and SAS Data Mining and Machine Learning, etc. There is a trial available from the SAS website where students can access these applications. In the near future these applications may also be added to the SAS University (Education Analytical Suite) Licences that they offer. SAS also have a new one month trial available called SAS Analytics Cloud that includes a SAS 9.4 environment and a JupyterLab open-source programming environment. This supports multiple users (Up to 5 persons). In terms of education purposes SAS have have SAS Programming 1 and SAS Statistics 1 available to students wishing to learn and improve their SAS coding skills. Students that are interested in furthering their qualifications may also be interested in the SAS Academy for Data Science, there is a seven day trial for this and they also offer a 50 percent discount for students wishing to enrol on the course. Also, www.sas.com/uk/academic is a another great resource for student support materials. this is a reminder that we run the DT265 social night tonight at 6pm. It's an excellent opportunity to mingle with current 265 students of all years and streams, as well as alumni students. Please make sure you attend this event tonight. We are in the Kevin Street Annex building's canteen on the ground floor. There is a sectioned off private area at the back of this canteen for us. Finger food refreshments will be provided. the group project class resumes this week. Your new lecturer John Pugh is looking forward to meeting you all. The deadline for stream selection is 12.12.2018.
you will have to make a choice soon if you want to continue with either the software development stream or the data analytics stream in semester 2. Tonight, I am going to give an overview of your choices at the beginning of your OOSD class. there will be no further Group Project class this semester. Classes will resume next semester with a new lecturer. the annual DT265 social night had to be moved from the 16th of November to Monday, 10th of December at 6pm. The social night is an opportunity for current DT265 students of all stages and DT265 alumni to mingle and exchange experiences on the programme and network. Refreshments and some finger food will be provided. The social night will take place in the reserved section of the DIT Canteen, Kevin Street Annex ground floor. Two separate programming competitions on the same day in the same place - a Datathon and a Hackathon. Last year's event saw over 200 students from many different Universities / Institutes of Technology attend. This year for the first time, AIB will be holding the event in their brand new Technology Centre of Excellence in Central Park, Leopardstown, Dublin 18. Entrants are invited from Irish 3rd Level colleges to enter and attend the DataHack 10th November 2018 for a fun 12-hour event (8am - 8pm) where they will compete for great prizes. the Enterprise Application Development (EAD) class for Tuesday 9th October (6-10pm) has been cancelled. there is a work placement info session scheduled for 17 October 2018@ 6pm in KA-3-023. The session is expected to last 30min to 1hr, depending on how many questions there are. The work placement is just an option for DT265A. If you are not interested in going out on a full-time, 6 month work placement, please keep attending the group project module, which is the default choice for the part-time course. just a reminder that there will be no OOSD lecture on Tuesday, 9th Oct. I will upload a lab sheet with exercises on webcourses. You can complete those in the lab - Hithesan will be in A116 from 6:30pm, or you can work on them at home if you prefer. we will be holding our individual project class on Wednesday 10th October from 6pm-7pm in room KA3-023. The session will focus on academic writing, references and citation. I will give a quick demonstration on how to use the Zotero reference management software. as part of the Higher Diploma experience we host a DT265 social evening once a year where students present and past can mingle and exchange experiences in relation to the programme. This year we hold the DT265 social night on the 16th of November at 6pm in the DIT Kevin Street annex canteen. There will be a section reserved for the event. I hope to see many of you there for it. It's a great opportunity to discuss your experiences and also get to talk to some of the graduated DT265ers who are coming in especially. there won't be a project class this evening from 6pm to 7pm (Wednesday 26th September). The next project class will be held on Wednesday 10th October and will present information on academic writing, referencing and citation. I will send a reminder email closer to the date for the next project class. please note that the class tonight will be in A116 computer lab (same lab as last week)for the whole duration of the class 6:30-9:30pm. I will update this post later with a link to the notes. there will be no Advanced Databases class tonight. The class will be rescheduled. This also affects the lab submission, which will be moved to next week. Materials will be online though regardless. we are going to hold a work placement information session for you in teaching week 5, on the timetabled slot for the project seminar. The work placement is an option. If you are not interested in work placement, you do not need to attend. The info session is scheduled for Wednesday, 17 October 2018 @6pm in room KA-3-023. Fidelity Investments are coming into DIT to speak about intern and graduate opportunities on Thursday (tomorrow) from 1-2pm and plans to address 3rd , 4th year and postgraduate students about opportunities within the company. The talk will take place in KEG007. 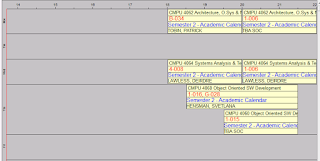 timetable updates have been posted on the left panel of this blog for DT265A-year 1 and year 2. This is for the DT265A-DA stream students. The Advanced Databases webcourses module is now available for enrolling. Search for DT265A Advanced Databases, or use the course code CMPU4079. some of you have contacted me in relation to your access to timetables. I have published the latest version on the left side panel of the blog for DT265A year 1 and year 2. 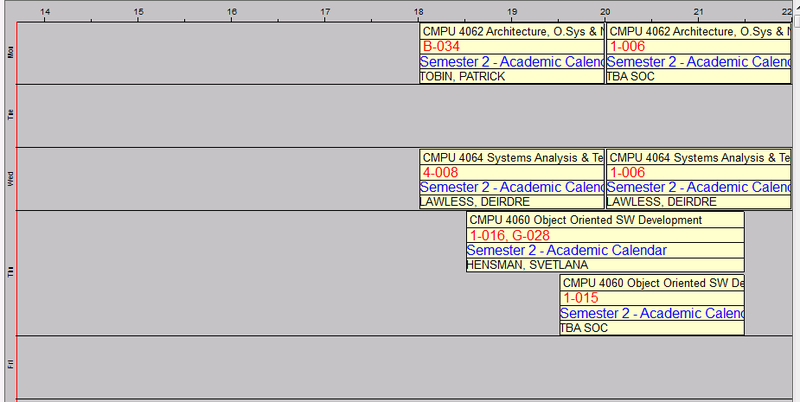 Classes start next week, as per DIT academic calendar. This email is for Higher Diploma students who started in September 2017. The HEA have now reopened the springboard courses website for you to confirm your re-registration for the programme. You need to confirm this re-registration so that the HEA will pay your fees again for this semester. Confirming this registration is a condition of the programme; and failure to do so will leave you liable for your own fees. To confirm re-registration, you simply need to log in to the springboard courses website and click the re-registration /second registration button. Closing date for this will be 31st September, but please do it now. It only takes a minute or two and will save you an awful lot of grief should you forget. Many students did this when asked during the Spring but a number of you did not. The HEA have been very accommodating in re-opening this process for you -- otherwise you would be liable for the remainder of your fees. Class reps or anyone feeling useful, as this information is important, I would appreciate it if you also posted this on any Facebook or WhatsApp groups etc. If you are planning on doing a work placement as part of the higher diploma, and you are in your year 2 of part-time study, please register at this link in order to receive the specs for vacancies that come in to the School of Computing. 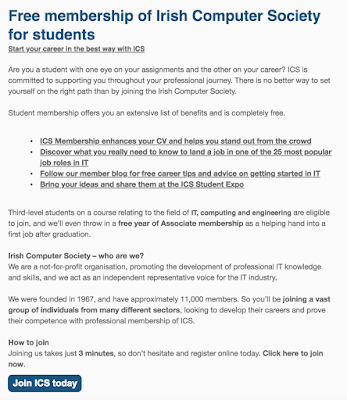 The Irish Computing Society is offering free membership to students now! The Irish Computer Society is the membership body for the IT sector in Ireland, with over 10,000 members. We act as a representative voice for those members, furthering the development of IT knowledge across the country. For more information on our student membership have a look at their website. Joining ICS is easy too, it’s just a case of online form, which takes less than five minutes. Bank of Ireland are holding a hackathon 6th-8th April. The ICT Graduate Development Programme 2018 with Kerry is currently open for applications. Kerry are looking for smart, innovative and collaborative Graduates to work across business analyst, technical delivery and development, and infrastructure roles. Candidates will be matched to roles that best suit their abilities. However, Kerrywork with graduates to help them develop a full set of skills to become leaders within ICT and Kerry during their careers. Graduate Programme, Start Jan 2019, interviews in March 2018! This is for students interested in a graduate programme commencing in January 2019. The interviews are actually held this month! The HEA have now opened the springboard courses website for you to confirm your re-registration for the programme. You need to confirm this re-registration so that the HEA will pay your fees again for this semester. Confirming this registration is a condition of the programme; and failure to do so will leave you liable for your own fees. Closing date for this will be this week, but please do it now. It only takes a minute or two and will save you an awful lot of grief should you forget.